We never like it when we see articles that are smashing a Newcastle player after they have given a poor performance. Not much, other than it brings the player further down – it certainly doesn’t help them. Every player we have on the team gives 100% effort in every single game – sometimes they don’t play well sometimes they do – that’s the nature of football. Newcastle are struggling at the moment with four successive defeats and we are not playing particularly well. 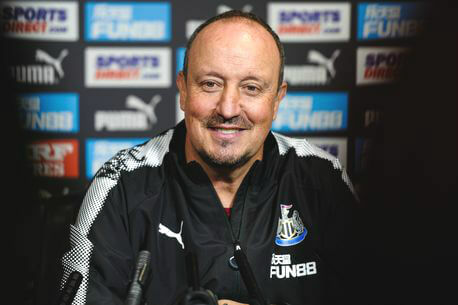 Rafa has given his press conference today for the game at the Hawthorns tomorrow night and he has talked forcefully about a number of things before the West Brom game. He has talked about where we were after the transfer window closed in early September and that the major goal this season is to stay in the Premier League. Just like last season when the major goal was to be promoted – preferably in an automatic position – and we were able to do that. And there were bumps – sometimes big bumps – along the way – like being beaten twice by Blackburn who were relegated. And then stumbling near the end of the season when Brighton were 7 points above us with just 3 games to play. If we stay in the Premier League the club will get all that big money again and Newcastle will at least be on a fairly level playing field with the rest of the Premier League clubs. That was not true last summer. “If you want to sign a striker who’ll score 20 goals, you must pay £40M. Rafa is well aware that a lot of the fans are agitated and critical at the moment. The manager and his players will be doing their utmost to get 3 points at West Brom tomorrow night. Let’s hope we can so that – that would be absolutely terrific. How Will Newcastle Fare At West Brom? Previous Post Here's Newcastle's Tough Schedule Through January 1st - How Many Points? as i said earlier Rafa knows exactly whats going on 100% in the loop !!! I’m still convinced that if Mitrovic had been given a run in the team as long as Joselu’s been given he’d have bagged some goals. No idea what Rafa sees in Joselu that Mitro doesn’t have. I think the reason Rafa ‘doesn’t trust’ Mitro is becasue when he does eventually get on the pitch (if at all), he’s too eager to prove his worth. He’s too young to just decide he’s no good. Got a feeling if we let him go, he’ll tear it up somewhere in Europe with actual game time, and come back to the Prem to be someones no.1 striker, meanwhile we’ll still have Joselu moping around up top. I don’t get it, is that James Clavell’s Shogun? I cant except what rafa said no way that player should be on the pitch very lucky to score against liverpool stoke must be rubbing there hands if he plays tomorrow night it will be a disgrace to the others he missed a sitter after 3 mins on sat then he went missing he cant hold play up for midfild to catch up ritchie has done nowt for 4 weeks he need resting to many of them know even if they dont play well they’ll be on the team sheet for next game . Don’t get me wrong I don’t agree with all the team selections but that’s the same for every supporter in every division. He has to say that, the bloke’s nerves are shattered. I think it’s the opposite and far from making his team mates comfortable he’s infecting the whole team. Well said jail surly he has to change for tomorrows game joselu i realy think we will lose if he start mitro deserve a game from the start if he did i think he will be up for it but coming on with what evers left dose not give you conference. These quotes from Benitez sound like a parting shot…. could this be a message to us all that the takeover is all but done and he’s getting in a few digs before Ashley leaves? falling through said he’ll still be here. I’ll be really disappointed if he doesn’t start Mitro tomorrow. Joselu is spent, he stuck with Sels just a little bit longer than he should have but eventually done the right thing. He’s got nothing to lose by chucking him in, if he does the business he can say he’s made him hungry enough in his absence. If it doesn’t work and he ambled about or gets sent off he can say I told you so. He has to start him. I think Rafa will demand talks if it doesn’t go through and won’t be so trusting this time round. Rafa held talks in the summer and was fed broken promises to keep him here, He wont be made a fool of again. I think you can clearly see in the interview how p@ssed he is with the current situation.. Hence the swipe at Ashley for no backing in the summer. Rafa has said it and we all need to pay heed. It’s important we stick together at this time in support of the team and our players. Every manager, even the super successful ones, will have their critics who know better than the guy in charge who should play where in the set up. Rafa is no exception. He makes and will make decisions which might seem, frankly, bonkers, at times, but he is, without any doubt, the best manager we have seen since Ashley rolled up, and for us the fans, for all who love our club, he’s our only hope. Keep the faith. Right I’ll change my name to someone!! I was actually referring to the stalwarts like Sparky, Hibbit and Shire who said they’d leave if the deal wasn’t done (which would be a pity if they did) but if others wish to commit seppuku! I’d recommend not doing so as the team will continue with or without Ashley. That’s what baffles me, the fact that these people questioning his every decision think that there’s better managers out there that will come in to manage this team on a shoestring and have their every decision questioned by experts like catchy. Could have been Wolf, Ram and Hart. I expect not many will get that reference. It was only for eleven months and he scarpered, did Ashley really stay away.